3 Guys, 3 Bears…One Awesome Trip! 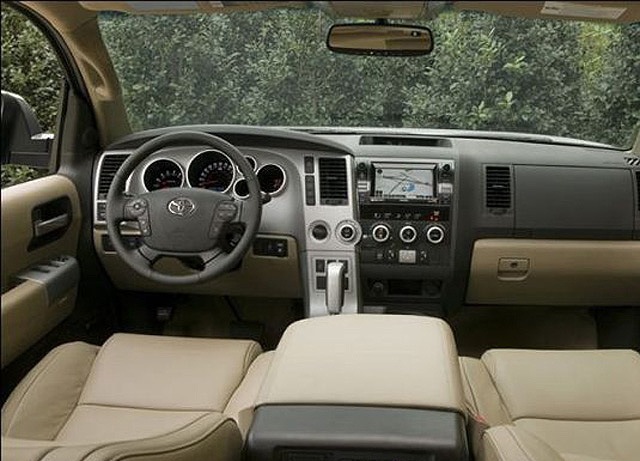 There is nothing more fun for a hunter than taking a long road trip with the guys and getting away from it all. The difference between the average ‘getting away from it all’ and a hunter’s ‘getting away from it all’ is that the hunter’s version often times includes a stand and some great harvest stories. This rang true for Dave, Tim and Jason. One week in September they arrived at my front door with weapons in hand and excitement in their eyes. 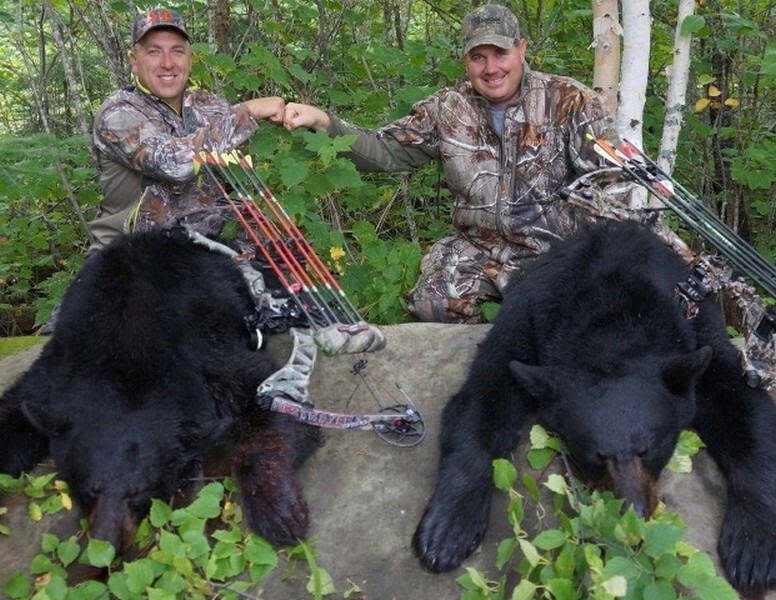 Though it was Dave’s second hunt with us, it was both Tim and Jason’s first time hunting a bear. Dave had acquainted them with what to expect and the basics of our operation and much to the boy’s excitement, we were providing them all with baits that seemed to be jam packed with bruin. The first night came with all guys coming to camp empty handed but Dave letting us know that his bait was just a Bear Highway….they were everywhere! Tim had heard a bear and Jason had yet to have any sign of. With that we both agreed that this could happen to anyone and that it’s better than wounding and wasting a bear. I knew tomorrow he would have a different plan. The next day Jason came in for his coffee and sat quiet. The thought of the day’s play could be read in his eyes and it was obvious that today he woke up with serious intention. Dave and Tim decided to load the boat and spend the day kicking back while Jason set out as tightly wound as he could be. The day wore on and not a truck in sight. As the night fell, Jason arrived with a tired, defeated look in his eyes. “Nothing. I didn’t see a thing today. It was a long day.” I knew that the events of the day prior had made today seem much longer but I knew that his determination hadn’t left. The following morning, Jason met with Terry and they came up with the new game plan. It was a variation of the original but the outcome was planned the same….Come home with a bear! As Jason left for the day, we all settled back into our daily routines, me in the lodge, Tami back to marketing and Terry back out to the baiting. At 3:12pm a black truck made a hasty entrance to the resort and straight over to cabin 6. Jason was back! He was energized as he exited the truck and fists pumped the sky! “I got it! It’s down!” With a couple of high fives and congratulations I could just see the pride in his eyes. He had finished the group with 100% success rate! As he tied the tell-tale orange flag for the other two on the lake to see, he began to load the truck with retrieval supplies. As they all arrived back with Jason’s bear, the camaraderie was thick. Each were successful and each just as happy for each other as themselves. When a hunter ‘gets away from it all’ it’s what they come away with afterwards that counts! You’re invisible. Or at least you think you are. After all, you’ve done all the right things: bought that pricey camo that matches your surroundings, painted your face with lots of greasy face paint, and you are even wearing camo boots. 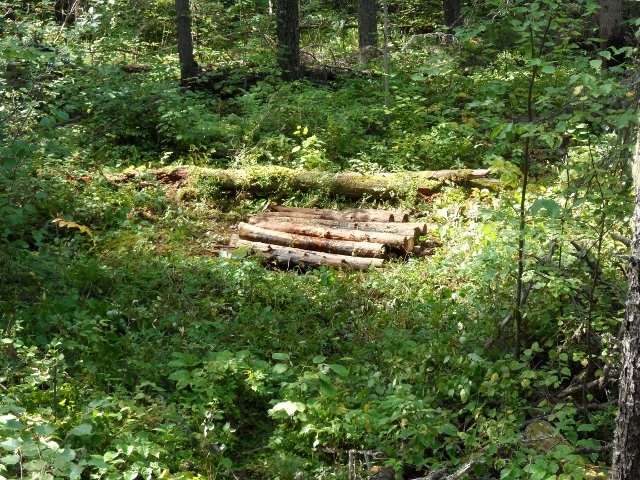 Now all you have to do is sit there, soak in a little sunshine, and wait for a big boar to show himself. A common mistake that has ruined plenty of big-game hunters’ chances is setting up where direct sunlight can reach them. Sunshine turns a camouflaged hunter from an indistinct shadowy figure into a glowing beacon. Dappled sunlight shining through a canopy of leaves isn’t usually a problem. But direct sunlight can reveal your whereabouts and end your hunt. Camouflage clothing’s basic function is to break up our outline – tricking our prey’s eyes into passing over us in their constant search for danger. The human silhouette is incredibly distinct in the wilderness – there is no other form like it. To fool game, it is essential to reduce our human outline. The best camo patterns utilize starkly contrasting colors in their design, thus changing us from a human form into something indistinct and non-threatening. Interestingly, for those of you traditional hunters like me – a good plaid pattern like Fred Bear often wore can work almost as effectively as modern camouflage. Remember that sunlight moves as the earth rotates. Set up your ambush in a location that allows you to remain shadowed as the light moves around you. If you are still-hunting or stalking, move efficiently through areas of sunshine and then pause to watch and listen when in the shadows. Set up in dark shade that offers good shooting lanes. Remember to keep your hands and face camo’d up as well – if left uncovered, they are a dead giveaway even in the shadows. There is nothing more fun for a hunter than taking a long road trip with the guys and getting away from it all. The difference between the average ‘getting away from it all’ and a hunter’s ‘getting away from it all’ is that the hunter’s version often times includes a stand and some great harvest stories. This rang true for Dave, Tim and Jason. On September the 7th they arrived at my front door with weapons in hand and excitement in their eyes. 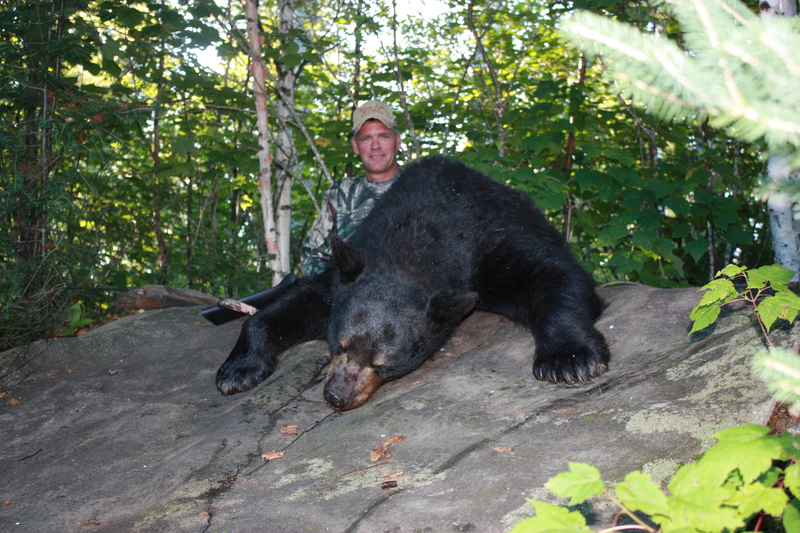 Though it was Dave’s second hunt with us, it was both Tim and Jason’s first time hunting a bear. Dave had acquainted them with what to expect and the basics of our operation and much to the boy’s excitement, we were providing them all with baits that seemed to be jam packed with bruin. The first night came with all guys coming to camp empty handed but Dave letting us know that his bait was just a Bear Highway….they were everywhere! Tim had heard a bear and Jason had yet to have any sign of. The following night had proven fruitful to both Dave and Tim, taking their trophies earlier in the dusk hours. Jason had heard several sounds around him but had yet to spot. He was fine with that though as the following day was his birthday and he felt that a birthday bear would be that much more fitting. The next morning as the boys began to prepare their bears, Jason prepped and began that drive to his stand. Thoughts raced through is head as to what his day would hold and how he was going to handle harvesting that bear. Early that evening, I spotted the truck pulling in, my heart was wild with anticipation….had he gotten his birthday bear? As Jason emerged, his face was pulled with a frustrated look and the color was drained. “I missed!” was all he said. After a few minutes of silence, Jason filled me in on the adventure. “I was just opening my pb and j and having a bite. I saw a set of ears pop up and slowly put the sandwich on my lap. 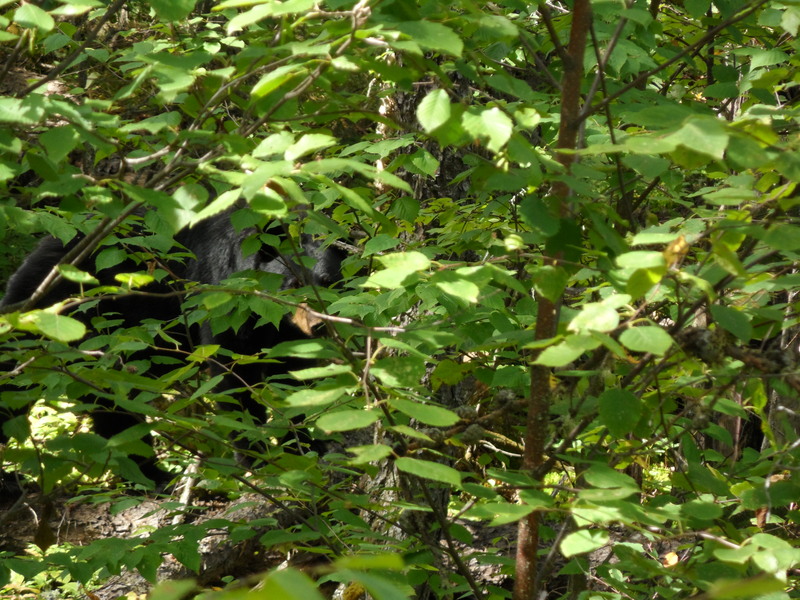 I lifted my gun just as the bear emerged to my right and he stood and sniffed the air…I think he wanted my sandwich! He dropped and began to lick the tree directly broadside and I fired……the bullet went low and right below. No hit but just hit the ground. I have NO IDEA what happened! The bear took off like a bat out of hell and that was it. I sat for about thirty minutes and had to get out of there. I am so frustrated that I know I couldn’t shoot proper a second time. Tomorrow I am taking my .270.” With that we both agreed that this could happen to anyone and that it’s better than wounding and wasting a bear. I knew tomorrow he would have a different plan. The next day Jason came in for his coffee and sat quiet. The thought of the day’s play could be read in his eyes and it was obvious that today he woke up with serious intention. Dave and Tim decided to load the boat and spend the day kicking back while Jason set out as tightly wound as he could be. The day wore on and not a truck in sight. As the night fell, Jason arrived with a tired, defeated look in his eyes. “Nothing. I didn’t see a thing today. It was a long day.” I knew that the events of the day prior had made today seem much longer but I knew that his determination hadn’t left. The following morning, Jason met with Terry and they came up with the new game plan. It was a variation of the original but the outcome was planned the same….Come home with a bear! As Jason left for the day, we all settled back into our daily routines, me in the lodge, Tami back to marketing and Terry back out to the baiting. At 3:12pm a black truck made a hasty entrance to the resort and straight over to cabin 6. Jason was back! He was energized as he exited the truck and fists pumped the sky! “I got it! It’s down!” With a couple of high fives and congratulations I could just see the pride in his eyes. He had finished the group with 100% success rate! As he tied the tell-tale orange flag for the other two on the lake to see, he began to load the truck with retrieval supplies. As they all arrived back with Jason’s bear, the camaraderie was thick. Each were successful and each just as happy for each other as themselves. The head mechanic at Calgary Toyota doubted if they had the expertise to put this vehicle back together, even if they had enough parts to do it. And, to add insult to injury, the bear took a big dump in the back of the SUV ….and then broke out the rear window. There is nothing more fun for a hunter than taking a long road trip with the guys and getting away from it all. The difference between the average ‘getting away from it all’ and a hunter’s ‘getting away from it all’ is that the hunter’s version often times includes a stand and some great harvest stories. This rang true for Dave, Tim and Jason. On September the 7th they arrived at my front door with weapons in hand and excitement in their eyes. 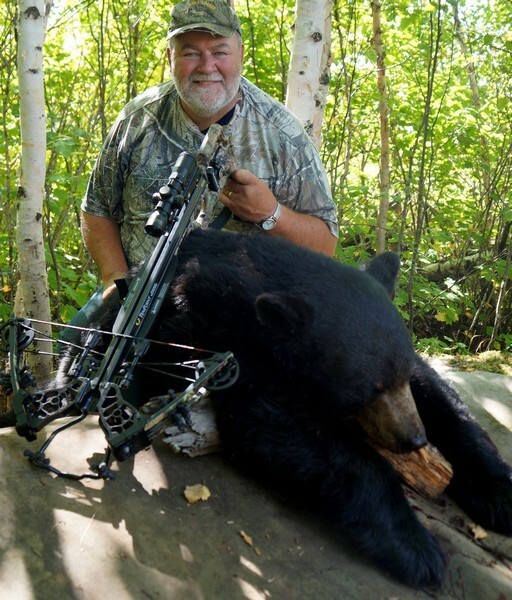 Though it was Dave’s second hunt with us, it was both Tim and Jason’s first time hunting a bear. Dave had acquainted them with what to expect and the basics of our operation and much to the boy’s excitement, we were providing them all with baits that seemed to be jam packed with bruin. The first night came with all guys coming to camp empty handed but Dave letting us know that his bait was just a Bear Highway….they were everywhere! Tim had heard a bear and Jason had yet to have any sign of. The following night had proven fruitful to both Dave and Tim, taking their trophies earlier in the dusk hours. Jason had heard several sounds around him but had yet to spot. He was fine with that though as the following day was his birthday and he felt that a birthday bear would be that much more fitting. 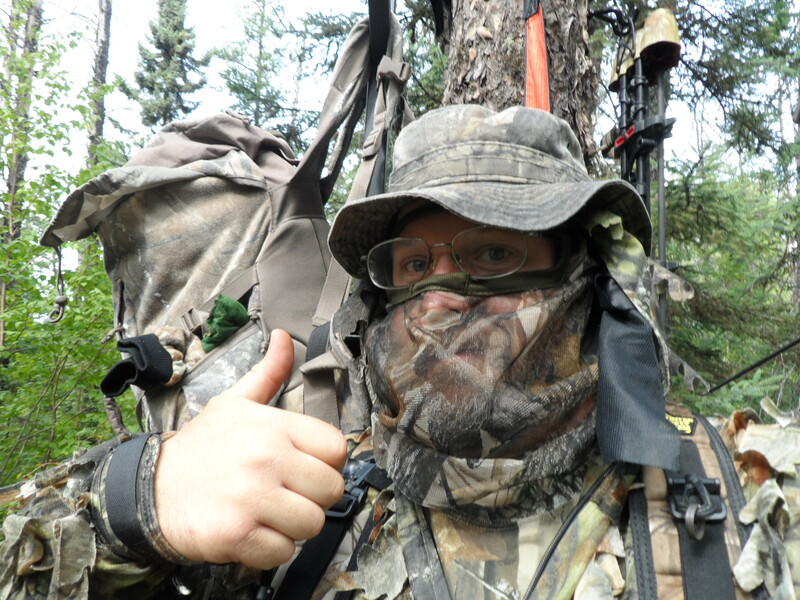 The next morning as the boys began to prepare their bears, Jason prepped and began that drive to his stand. Thoughts raced through is head as to what his day would hold and how he was going to handle harvesting that bear. Early that evening, I spotted the truck pulling in, my heart was wild with anticipation….had he gotten his birthday bear? As Jason emerged, his face was pulled with a frustrated look and the color was drained. “I missed!” was all he said. After a few minutes of silence, Jason filled me in on the adventure. With that we both agreed that this could happen to anyone and that it’s better than wounding and wasting a bear. I knew tomorrow he would have a different plan. The next day Jason came in for his coffee and sat quiet. The thought of the day’s play could be read in his eyes and it was obvious that today he woke up with serious intention. Dave and Tim decided to load the boat and spend the day kicking back while Jason set out as tightly wound as he could be. The day wore on and not a truck in sight. As the night fell, Jason arrived with a tired, defeated look in his eyes. I knew that the events of the day prior had made today seem much longer but I knew that his determination hadn’t left. The following morning, Jason met with Terry and they came up with the new game plan. It was a variation of the original but the outcome was planned the same….Come home with a bear! As Jason left for the day, we all settled back into our daily routines, me in the lodge, Tami back to marketing and Terry back out to the baiting. At 3:12pm a black truck made a hasty entrance to the resort and straight over to cabin 6. Jason was back! He was energized as he exited the truck and fists pumped the sky! With a couple of high fives and congratulations I could just see the pride in his eyes. He had finished the group with 100% success rate! As he tied the tell-tale orange flag for the other two on the lake to see, he began to load the truck with retrieval supplies. As they all arrived back with Jason’s bear, the camaraderie was thick. Each were successful and each just as happy for each other as themselves. Like I said, when a hunter ‘gets away from it all’ it’s what they come away with afterwards that counts!